The process is iterative, not linear. Building a model using a matched photo entails going between drawing edges, orbiting around, drawing more edges, going back to your matched photo scene, and drawing yet more edges. Every photo is different, so the ones you work with will present unique challenges that you’ll (hopefully) have fun figuring out. Don’t forget the photo textures. By far one of the coolest features of photo-matching is the ability to automatically photo-texture your model’s faces by using your photograph as “paint.” It’s a one-button operation, and it’s guaranteed to make you smile. If you orbit away from the vantage point you set up, you’ll know it; your photograph will disappear. You can easily get back by clicking the scene tab for your matched photo. The tab is labeled with the name of your photo at the top of your modeling window. Starting at the axis origin, trace one of the edges in your photograph with the Line tool. You always want your lines to turn red, green, or blue when you’re starting. 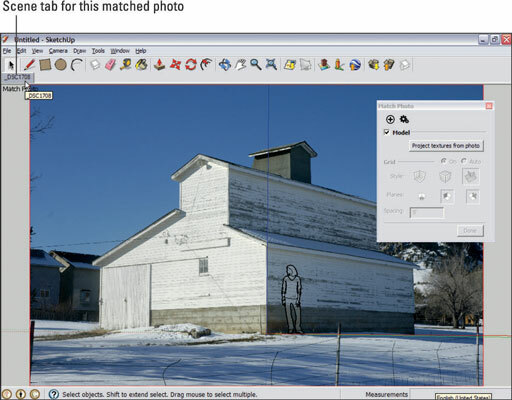 Use SketchUp’s modeling tools to continue to trace the photograph in three dimensions. Always start an edge at the end of an edge you’ve already drawn. Doing so helps to assure that your results are what you expect. Never draw an edge in midair. Okay — this is the same as the last one, but it bears repeating: When you draw edges based on other edges, you get the best results. Orbit frequently to see what’s going on. You’ll be surprised what you have sometimes — tracing a 2D image in 3D is tricky business. Get in the habit of orbiting around to check on the results and draw certain edges. Click the matched photo scene tab to return to the proper view. Use other tools (such as Push/Pull and Offset) when appropriate. Nothing prevents you from using the full complement of SketchUp’s modeling tools. Pay attention to the colors. With a color photograph as an overlay, seeing what you’re doing can be tricky. Watching to make sure that you’re drawing the edge you intend to draw is critical. Draw angles by connecting the dots. If you need to trace an edge in your photo that doesn’t line up with any of the colored axes (an angled roofline, for example), figure out where the endpoints are by drawing perpendicular edges and connecting them with an angled line. Show or hide your photograph. You can fiddle with the visibility of the picture you’re using — doing so sometimes helps you see what you’re working on. You can find the controls in the Modeling Settings section of the Styles dialog box’s Edit tab. You can edit any texture in your model — including ones produced by photo-matching — by opening them in image-editing software (such as Photoshop) directly from SketchUp. This trick is handy for taking out stuff you might not want in your photos, such as trees, cars, and ex-husbands.